Red Hot Valentine Theme Party. Red theme party. Red is the color of love, of passion and, of course, Valentine's Day! Planning a red theme Valentine's party is fun and simple! It works for a party at home or a larger event at a rental hall, bar or restaurant. Invite your guests to have a RED HOT evening by sending them a box of Red Hots, of course! You can send it with a personalized Valentine's Day invitation, or print the information on a label and stick it on the back of the box. Mail this in a small mailing box with a little red tissue. Or let you guests know they are going to be attending a red hot event by sending red ticket invitations in a matching red envelopes. Add some red confetti to the envelope for a surprise! Red Hot Valentine's Day Party! Pucker Up for a Red Hot Valentine's Day! And don't forget to tell everyone to wear red, too! Set the mood for your party with red lighting. You can buy red lightbulbs at many stores. Replace lamp bulbs with red, or, if it's in your budget, hire a lighting company to change ceiling lights to red and to add red spotlights on the walls. Since this party is red hot, put out a lifesize cutout of the host or hostess as a giant red heart! Another fun look is to fill the ceiling with balloons. Trust me, it looks great! Use lots of red balloons and silver curling ribbon and let them fly! Red balloons will brighten up your venue. Don't forget to add a red balloon weight! We also love crepe paper hanging for a classic party look. You'll also want lots of candles at this party. Use votives on the tables and larger candles throughout the room. Since everything on your table will be red, use a contrasting tablecover like siver or white. Then use these Valentine's Day paper goods or go all red paper goods - plates, cups, napkins - the whole kit and kaboodle! Use the same color if you're using rental linens for a larger event. Use red beads as napkin rings for an added red touch. I would use red roses for this party! Every florist at Valentine's Day will be ready with red roses in crystal or glass vases. (Just be sure to order ahead of time!) Scatter rose petals on the tables, too! And when you set up the bar, think red again! Serve all your drinks (which should be red!) in red barware. You can get shot glasses, glasses and more all flashing or glowing red. The glowing drink glasses also make a great favor. Keep centerpieces simple with Valentine's Day couple theme centerpiece. Pair the centerpiece with a bunch of red and white balloons. Then set up a tempting red candy buffet! A local candy store will have a great assortment of candy for Valentine's Day - all red! You can get red Hershey's kisses, Red Hots, Red M&Ms, Atomic fireballs and more. Use glass jars or plastic candy tubs and metal scoops and display all the candy on a buffet table. 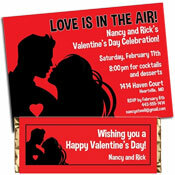 Next to the candy jars, place a bundle of personalized Valentine's Day theme party favor bags. They make a great favor! Make up pieces of paper with famous couples written on them. As guests arrive, pin or tape the piece of paper to each of their backs, without letting them see what's written on it. The rules are that they can only ask and answer yes or no questions, to find out who the couple is. Or for amusing an adult crowd, check out our games for couples parties! Personalized lollipops are great for younger guests! Also, a little bag of candy hearts, chocolates and red roses for the girls are always winners! Check out our cute custom Valentine's Day Favor Bags, which your guests can fill with treats, and Happy Red Hot Valentine's Day from everyone here at Party411.com! Have a Red Hot Valentine's Day party!